“It was never easy work entering or leaving the little harbour, whether under sail or steam, nor is it yet. You seem to steer straight on to the reef till you almost expect to hear the crash of the ship’s bows, the wheel spins rapidly, she turns in her own length as the wheel goes hard down again. If a big wave struck the ship there would be one more set of ship’s ribs strewn aloing the coast. Currie Harbour had its origins in the salvage trade that developed on King Island. Two major shipwrecks occurred right here within a year, and the crews scoured the coastline for a sheltered harbour in which to load the rescued goods for shipping to Melbourne. The only spot to offer any protection was the landing spot used by David Howie, Constable of the Straits, on his regular patrols to search for shipwrecks and escaped convicts. When salvager Archibald Currie heard about ‘David Howie’s boat harbour’ he set up camp here, with huts, gardens and a smithy to guard the salvage of the Netherby, wrecked in 1866. Whatever its shortcomings as a safe haven, there was no better spot available on the west coast. 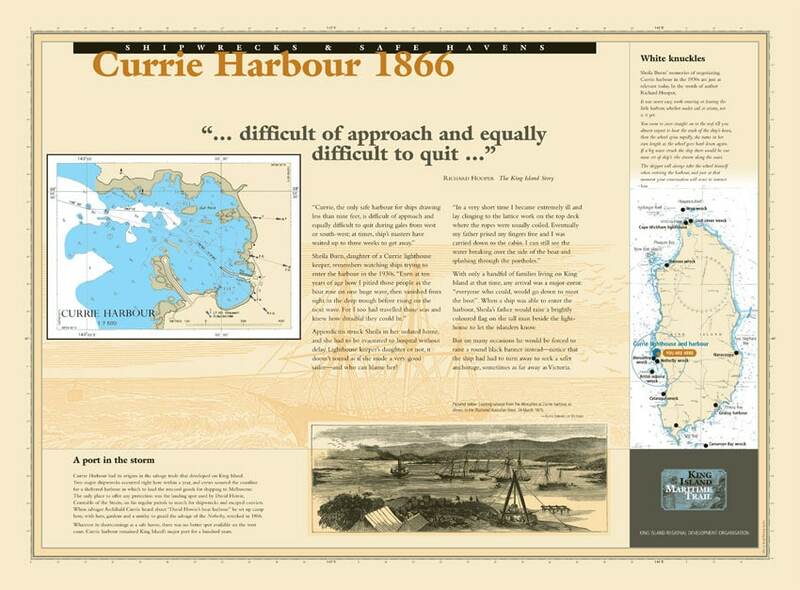 Currie remained King Island’s major port for a hundred years.